IBG researchers and faculty are published in many scientific journals. Below are some of the journals our work has been featured in. 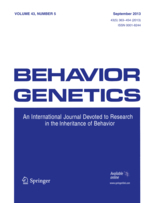 Behavior Genetics: The leading journal concerned with the genetic analysis of complex traits - is published in cooperation with the Behavior Genetics Association. Drug and Alcohol Dependence: Drug and Alcohol Dependence is an international journal devoted to publishing original research, scholarly reviews, commentaries, and policy analyses in the area of drug, alcohol and tobacco use and dependence. JAMA Psychiatry: JAMA Psychiatry publishes original, peer-reviewed articles about psychiatry and related fields. Journal of Abnormal Psychology: The Journal of Abnormal Psychology publishes articles on basic research and theory in the broad field of abnormal behavior, its determinants, and its correlates. Science: International weekly science journal, published by the American Association for the Advancement of Science (AAAS). Alcoholism: Clinical and Experimental Research: Founded by the National Council on Alcoholism and Drug Dependence, this journal gives readers direct access to the most significant and current findings on the nature and management of this serious health problem. American Journal of Medical Genetics Part B: Neuropsychiatric Genetics: Neuropsychiatric Genetics, Part B of the American Journal of Medical Genetics (AJMG) , provides a forum for experimental and clinical investigations of the genetic mechanisms underlying neurologic and psychiatric disorder.